The precise origin of the Monte Cristo has been lost to history, but here’s what we know: It’s a variation of the classic French croque-monsieur, a grilled-cheese-with-ham combo with a literary history of its own (it first popped up in Proust). The variation known as the Monte Cristo is rumored to have been invented in San Diego’s Coronado Hotel in the 1940s, although how it came from the bistros of Paris to the breakfast buffets of California is anyone’s guess. 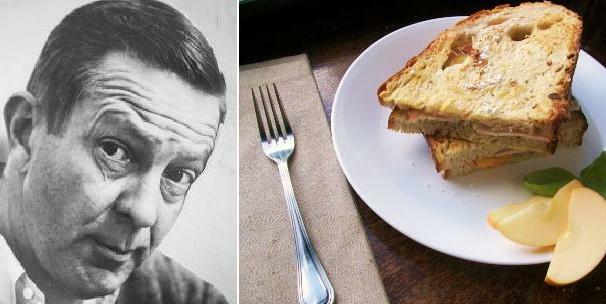 The sandwich was popularized by the Brown Derby restaurant in L.A., where Cheever might very well have discovered it. You can find the first published recipe for a Monte Cristo in The Brown Derby Cook Book, which describes it much the same way Cheever does – with three slices of bread, dipped in batter, fried in butter, and served with jam. This might sound like a heart attack waiting to happen (my mother, usually keen to try these recipes, heard the powdered sugar bit and and responded, “No … maybe? … but actually just no”). But, besides being an ideal hangover cure, combining French toast with grilled cheese finally solves the eternal brunch conundrum: sweet or savory? At last, we can have both at once. 1. 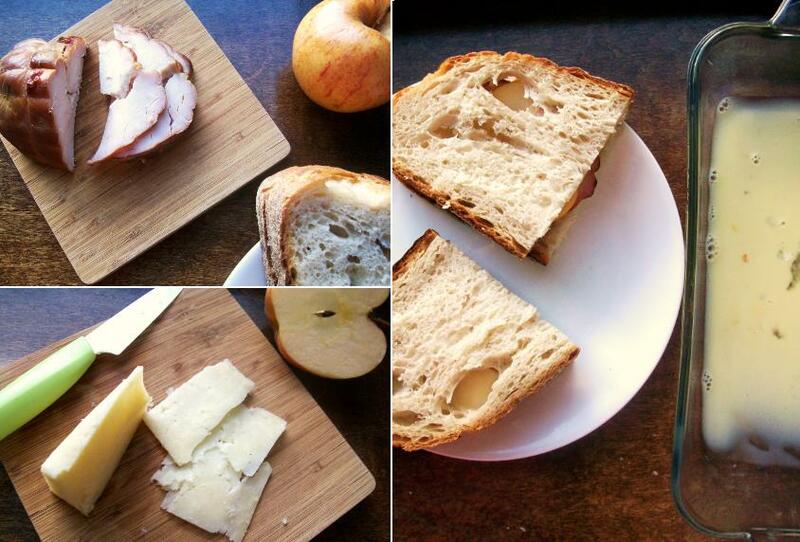 Assemble the sandwiches: On 2 slices of bread, layer turkey, cheese, and apple to cover bread completely. Top with remaining bread. Secure each sandwich with toothpicks. Trim crusts, if you’d like. 2. In a shallow baking dish, lightly beat egg with a whisk. Add milk, and whisk to combine. 3. In a nonstick skillet over medium heat, add 1 tablespoon butter; swirl butter around pan until foaming. Coat both sides of the first sandwich in the egg mixture, then lay it in the pan, pressing down gently with a spatula to compact. After 3 minutes, flip sandwich and fry opposite side until golden brown. Remove from pan, and dry on a paper towel. 4. Repeat step 3 with remaining 1 tablespoon butter and second sandwich. Serve both sandwiches with sprinkles of powdered sugar on top. For ease of frying, I suggest you start with 2 layers of bread for your first attempt and work your way up to 3 (or 4!). And – to appease my mother and get something fresh in here – I substituted apple for the more traditional jam. Despite having nothing of real substance to write here, I thought I would post simply to tell you how much I enjoy reading your blog. You manage to cover so much ground in such a concise and entertaining fashion. Always looking forward to the next one! That means the world, Calantha! It’s always fun to write these posts, but it adds so much when someone takes the time to comment. Thank you! I, too, want to say how delightful this blog is. I found it recently and look forward to seeing more. I am telling everyone I know about it. It is unique, interesting, and so well done! Like a French toast turkey sandwich! I’m intrigued… great post as usual! Thanks, Dana! It’s funny – I’m not a huge fan of plain grilled cheese, but add some smoked turkey and make it into French toast and I’m there! I guess I just need to gussy everything up a little. I’ve been loving your CSA posts this summer! How long does it last? Thanks so much! I’m very lucky because my farmer’s market does a CSA year-round, so we start our fall one this weekend. I just made a peach pie with the last of the summer peaches, and then it’ll be all fall veggies and fruits! don’t laugh but the best Monte Christo in Los Angeles is at Disneyland. True fact. and I don’t think it’s turkey, for sure it isn’t, but now I can’t remember what it is….corned beef? ham? might just have to go to Disneyland! And thanks so much for reading! I love your books.